(16/P107) TRENTON – Nonprofit groups working on projects directly related to wildlife diversity and education in New Jersey may now apply to the Department of Environmental Protection for matching grants to help support their endeavors, DEP Commissioner Bob Martin announced today. Grants ranging from $1,000 to $3,500 are offered through the Division of Fish and Wildlife’s Endangered and Nongame Species Program, using revenues generated by the Conserve Wildlife License Plate renewal fund. Approved projects will be funded for a single year. The application deadline is 5 p.m. Thursday, December 15. The awards are 50-50 cost share grants, and at least 25 percent of the grantee’s share of the project funding must be monetary. The remainder may be in-kind support. The grant program’s allotment for 2017 is $39,000. Work that may be eligible for grants include education/outreach projects, research projects, management projects or habitat protection projects. Some examples of eligible projects include those that minimize conflicts between humans and wildlife, control invasive species, create pollinator habitat or Monarch waystations or that gather data on underrepresented rare species. Since its launch in 2008, the program has awarded 67 grants totaling $198,000, all of which support a broad range of nongame wildlife research, management and education projects. Only nonprofit 501(c)(3) or 501(c)(4) organizations are eligible to apply for the grants. Requests must be submitted electronically to MacKenzie.Hall@dep.nj.gov and award notifications are expected to be made by January 27, 2017. 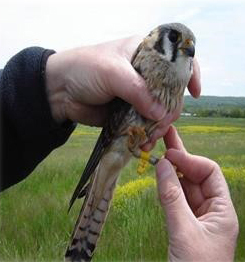 For more information about the program, or for proposal guidelines, visit the Conserve Wildlife Matching Grant Program at www.nj.gov/dep/fgw/ensp/cwgrants.htm or call the Endangered and Nongame Species Program at (609) 292-9400. Conserve Wildlife license plates may be purchased during the motor vehicle registration cycle at a Motor Vehicle Commission agency, online at http://www.nj.gov/mvc/Vehicle/DedicatedPlates.htm, at any New Jersey automobile dealer when buying or leasing a new car, or for more information call, (609) 292-6500 extension 5061 on weekdays to request an application to purchase a license plate via mail.